BUT FOR OHIO STATE, RETURNING IRAQI WAR VETERAN MIKE TABOR MIGHT NOT HAVE CONSIDERED A COLLEGE EDUCATION. And the nation might not have another extraordinary educator in-the-making. The senior history major is applying to graduate school for a master’s degree in education and plans to teach high school history. Tabor was not only older than the typical first year student chronologically, but light years away experientially. Ohio State’s Vets 4 Vets helped him make the transition between two very different worlds and find his place at Ohio State. While at Ohio State, Tabor has had many experiences that affirmed his choice. Last March, Tabor, along with seven other Ohio State undergraduates, had the opportunity of a lifetime: to relive history through the eyes of real World War II heroes. Paired with veterans returning to four Pacific island battle sites, the students were charged with recording their stories. Tabor was paired with Sgt. Major “Iron” Mike Mervosh. 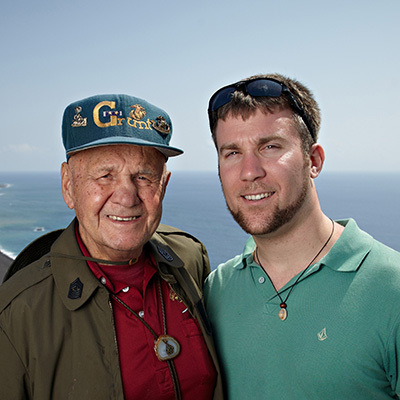 “Being on top of Mount Suribachi (on Iwo Jima) and listening to him describe the fighting was surreal and it is something I will not soon forget. I am honored to call Iron Mike a friend and to be able to pass on his stories,” Tabor said. As the first ever student organization at Ohio State for veterans, Vets 4 Vets creates a social network with opportunities for student veterans to connect with their peers outside of the classroom. Vets 4 Vets provides domestic and international veterans of military service an organization to transition to student life, while providing them resources to succeed and share their unique and similar experiences through community involvement, academics, and a social network.